Strut cards are the perfect front-of-house point of sale signage, easy to display, cost effective and are a popular choice amongst a variety of marketing sectors. 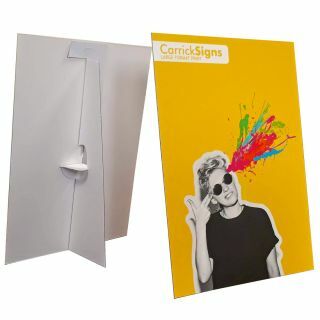 Supplied with a collapsable strut attached to the reverse of the card, allowing for a visually striking free-standing display. Printed on 2mm display card, either direct or vinyl mounted, available in standard sizes of A5, A4 and A3.